The Shure PA411 Antenna Combiner distributes DC power and RF signal for up to four Shure PSM®300 transmitters. The compact half-rack system significantly reduces the amount of antennas and power supplies needed when using multiple systems. Note: Antenna is not included. Please use the antenna that shipped with the PSM transmitters or other antenna from the appropriate frequency range. Connect the Shure PS60 power supply to a power outlet and to the power input on the PA411. Connect the 1-to-4 power cable to the DC power output on the PA411. Connect a power terminal from the 1-to-4 power cable to each P3T transmitter power input. Connect an antenna to the P3T antenna output on the front panel. Acceptable antennas include the ¼-wave antenna supplied with the P3T transmitter or any Shure antennas that cover 470-865 MHz. 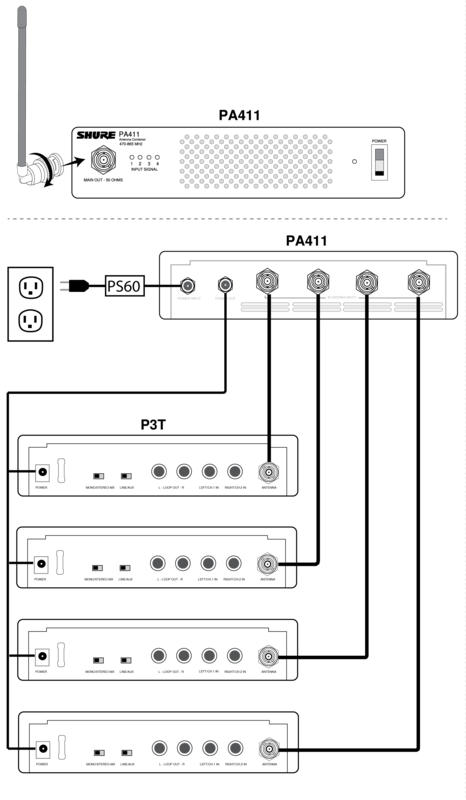 Connect each P3T antenna output to an antenna input on the PA411, using BNC coaxial cable. Antennas used for the purpose of radiating signals are limited to a maximum gain of 14 dBi. Each antenna must be positioned to observe minimum separation requirements from all users and bystanders. The following guidelines should be used when considering separation distances. Antennas must be placed such that, under normal conditions, personnel cannot come within 72 cm (~2.5 ft.) from any antenna. 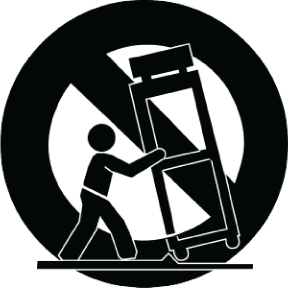 Adhering to this minimum separation will ensure that the employee or bystander cannot exceed RF exposures beyond the maximum permissible limit as defined by 47 CFR 1.1310, i.e., limits for General Population/Uncontrolled Exposure. Conforms to the relevant requirements of regulation (EC) No.278/2009, for low voltage external power supplies. Conforms to European Regulation (EC) No. 1275/2008, as amended. Meets requirements of the following standards: EN 300 422 Parts 1 and 2, EN 301 489 Parts 1 and 9. Certified by IC in Canada under RSS-123 and RSS-102. FCC ID: DD4PA411A. IC: 616A-PA411A.